OneBeacon Technology Insurance has expanded its capabilities by adding media liability and technology professional liability – and dedicated underwriters – to our product portfolio. These business lines were formerly part of our professional insurance division and now enable OneBeacon to offer a unified market with broadened technology solutions. This step also strengthens our service offerings, including cyber risk-assessment, credit monitoring and breach response providers supporting our insureds. To learn more, please feel free to contact Lloyd Takata at: ltakata@onebeacontech.com or David Molitano at: dmolitano@onebeacontech.com. You can also learn more about our expanded capabilities, including a complete look at our industry solutions, products and coverages at: onebeacontech.com. As the warmer weather settles in, those who enjoy boating may be excited to get back out on the water. 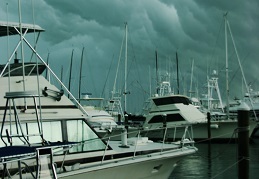 But whether you’re a captain or a passenger, remember that hurricane season is just around the corner. Stacy Paquet, Senior Vice President of OneBeacon Management Liability, will participate as a panelist at the upcoming Advisen Insights Conference in Chicago on May 19. Paquet’s session, “Emerging Trends in Employment Practices Liability Insurance,” will look into a variety of topics, including which states are driving EPLI developments, where the EEOC may turn next, and what defines a protected class. OneBeacon Financial Services’ President Craig Collins will present at the Bank Holding Company Association’s spring seminar on Tuesday, May 5. Providing information and networking opportunities for members of bank holding companies, the two-day seminar will take place at the Minneapolis Marriott Hotel in Bloomington, Minn.
Collins seminar, titled “Cyber-liability – How to mitigate the risk,” will take place at 10:50 a.m. and again at 11:30 a.m. For more information, please visit http://thebhca.org/Spring-Seminar-Agenda.